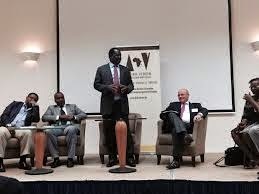 : DID RAILA TOUR GERMANY TO FUNDRAISE FOR REFERENDUM? DID RAILA TOUR GERMANY TO FUNDRAISE FOR REFERENDUM? Speculations are all over that Cord Leader Raila Odinga’s recent tour germany was to raise funds for the referendum campaigns. Raila travelled to Germany on September 16, where he started his tour in Berlin with Mombasa Governor Hassan Ali Joho and Senator Hassan Omar. According to sources, Raila’s tour was to woo investors on behalf of the 24 counties represented by Cord. On their first day Raila and his entourage spend the day at a roundtable meeting with the German African Business Association. "Our discussions were centered on the areas of Security, Infrastructure, Tourism and Green Energy," This is what Raila posted on his Facebook page. The team later had a breakfast meeting with Günter Nooke, Africa envoy of German Chancellor Angela Merkel. On his second day Raila had a lunch meeting hosted by George Schmidt, Africa Envoy of the German Foreign Office where he held discussion on partnership for growth. On Thursday the former PM toured Siemens Group of Companies where he met the Vice President. The Cord leader had a dinner hosted by Secretary General of the Friedrich Ebert Foundation Dr. Roland Schmidt "where we discussed a number of issues and possible partnership."